Welcome to St. Patrick's Catholic School! Thank you for visiting the website of St. Patrick&apos;s Catholic School. Since 1856, the people of St. Patrick Catholic Church have been providing quality, Christ-centered education to the children of rural, middle Tennessee. Our school welcomes children of all faiths in Pre-K through eighth grade and is known for its strong tradition of academic excellence. The faculty and staff believe in the dignity of each human person which results in a peaceful, joyful atmosphere in which the children can learn. We strive to partner with and be a support to parents so that together we can help each student become the person God created him or her to be. I hope that you will enjoy our website as well as contact us to visit St. Patrick School in person. The Holy Spirit is truly alive among us, helping us to form children who are well prepared to make a difference in our world. I hope to see you soon! God bless you! St. Patrick&apos;s has bus service to Dickson! Our bus runs to and from St. Christopher Church each day. Over 30 of our students ride the bus, significantly shortening their family&apos;s commute. St. Patrick&apos;s follows the curriculum of the Diocese of Nashville. Our traditional, challenging curriculum teaches higher level thinking skills without neglecting age-appropriate basic skills. St. Patrick&apos;s students can play on our sports teams as well as teams at Waverly Junior High for sports for which we do not have a team. Give to our Annual Fund! Sponsor our Legacy Club Dinner! Benefit Mobile: Buy gift cards, giving back a percentage to St. Patrick&apos;s! 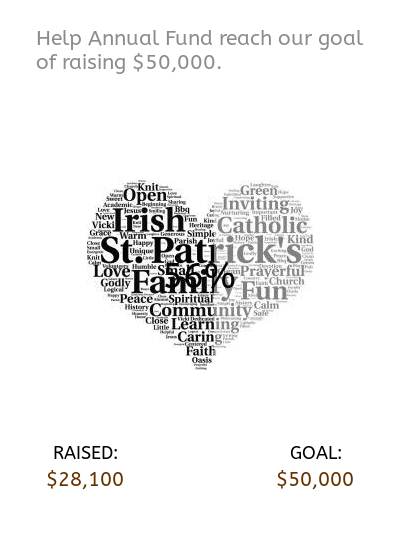 Amazon Smile: Choose St. Patricks McEwen TN as your cause! Class Bundl: A fast and easy way to shop for school supplies and give 5% to SPS! Registration is now open for the 2019-2020 school year! If you are a family interested in our school, we would love to meet you! Prospective families may contact the school office at 931-582-3493 to schedule a tour or ask questions. Financial assistance is available. Click here for Admissions Application! Take a peek into our classrooms!